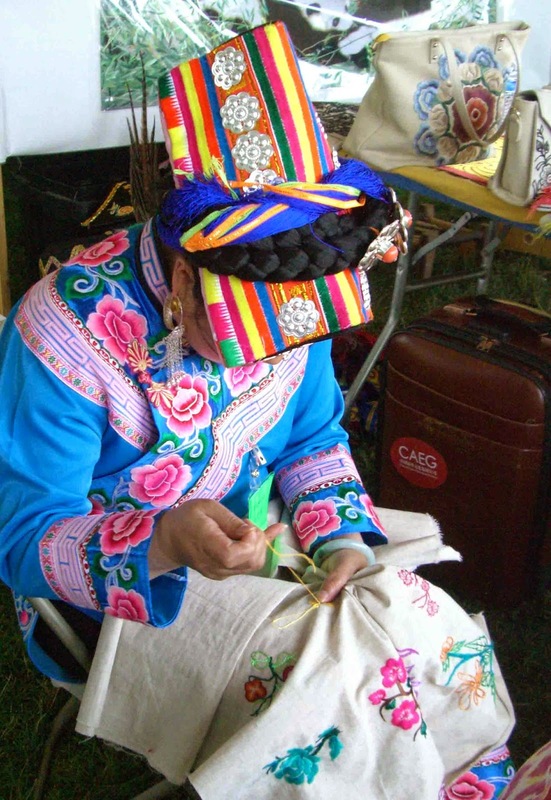 China is one of the featured countries at the 2014 Smithsonian Folklife Festival. Everyone watching this lady was as fascinated by her hat as by her needlework skills. The hat's medallion-embellished fabric was folded into a peak like the roof of a house. She stitched with floss in the same bright colors as the flowers cascading down her gown. She is from Sichuan, but the style of her embroidery would seem familiar to Hungarians or Ukranians or Americans doing a "folk art" stitchery. Almost every culture has an embroidery tradition based on naive flowers and joyful colors. Unfortunately, Americans are seriously lacking in the hat department.